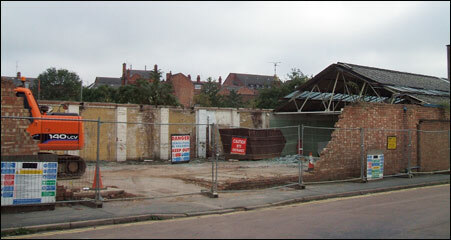 WILKINS AND DENTON, Station Road, Rushden. In March 1940 I left Adams Bros. factory at Raunds to work as a clicker at the firm of Wilkins and Denton in Station Road, Rushden. I had attended the Boot & Shoe Institute in Victoria Road, Rushden the previous year to learn clicking and pattern cutting. Meeting with other young clickers I realised that greater opportunities for higher earnings and promotion existed in Rushden. Boot & Shoe work in Raunds seemed to offer little for ambitious youngsters. Ambition being more wages. That first winter of the war I had my brush with the forces of the Law in Rushden. All vehicle lamps had to be blacked out to a Regulation pattern. I covered my cycle lamp glass and reflector with brown paper. A brown paper tube wrapped round the bulb to the glass. This gave a very limited light. The little beam enabled me to see the Way Posts down the Cow Pastures in Higham and along the Stanwick bottom road in the fog and blackness. In those days the road from the Theatre to Washbrook Road was steeper. Pedalling down the slope fast one could get up enough speed to ride up and over Higham Hill without having to walk. Returning home from night school just after nine o’clock, I went over the pedestrian crossing at the Washbrook Road junction at full pedal power. I hurled between a line of figures using the crossing. They were Police officers. They ordered me to stop. I was ticked off for not having the regulation blackout mask on my lamp; I showed too much light. I was sent on my way with a caution. Many workers cycled to Rushden in those days. If the bottom road from Stanwick to Chowns Mill was flooded, we would all have to turn back and take the Stanwick Top Road. In the winter when the weather was bad, we would all take the bus. Two double decker's from Raunds and a single decker from Stanwick. One of the double deck buses started at Ringstead. I cannot think of anyone who used a motor car to go to work. The workers on the bus were all men, except for two women from Stanwick. Seats on the bus were taken by the same person each day. The bus from Raunds Square would have the front inside seat empty until the bus reach the Red Lion. This was the second stop. Then Jack Walker would get on. The front seat was his. One morning in winter, when the weather was too bad to cycle a young lad got on the bus and sat in Jack's front seat. All the way to the Red Lion the others workers kept saying "You wait ‘til Jack sees you in his seat". As Jack climbed on the platform of the bus he called out " Who is in my seat". It was said humorously. As the bus went along the bottom road Jack leaned forward and taking off his cap said "Boy, if you’re going to sit in our seat you must do our job". With his cap Jack cleaned off the condensation to clear the window. Jack Walker was one of the great sages and humorists of Raunds. He had to appear in court as a witness to a fight in which a man was brutally beaten up. Asked by Counsel about the fight Jack described the blows as light taps. Counsel pointed to the marks on the face of the plaintiff and asked if they looked like light taps. "They were compared to the taps my Mother gave us boys at home" replied Jack. One morning in the winter of 1940-41 the frost and ice prevented the buses getting up the hill from Chowns Mill to Higham Ferrers. We had to get out and push the buses up to Windmill Banks. I remember looking back at the line of seven buses being pushed by men from Raunds, Stanwick, Irthlingborough and Finedon. 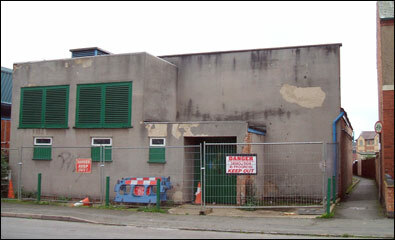 The factory owners were George Denton and a Mr Wilkins. I think that George Denton had ginger hair. Mr Wilkins seemed an elderly grey man who wore a Hamburg hat. He regularly came down from London to visit the factory. The factory, which was built horizontal, I believe had been burnt down some years before. To me the factory seemed immense and full of light. This was unlike Raunds factories that were old, dark and vertical. Conversation in the greater space was limited. This prevented the clickers from talk­ing - only to their neighbour. They did not argue politics or religion nor did they sing songs and hymns in harmony as they worked as they did in Adams' clicking room. They took snuff, but in moderation. The great difference from a Raunds factory was that the men did not ridicule me for going to Technical School. Rushden accepted and encouraged one to go to the Boot & Shoe Technical School. Jeff Morgan and two of his apprentices were engaged to install modern lighting in my first year. I cannot recall if they also installed electric Motors on the presses, or whether they had previously been changed from belt drive. The Clicking Room foreman was Dennis Knight. His Mother-in-law, Mrs Desborough, kept the little sweet shop lower down Station Road. I was again the one sent out for cigarettes for the foreman. Dennis Knight was my instructor at the Boot & Shoe Technical Institute. He later left the firm to go elsewhere. The new foreman came from London. I did not know the Closing Room forewoman. Relationship between the foremen of all departments was very formal. Nothing occurred like the clash of temperament and personalities that occurred at factories at Raunds. It was a totally different world of shoe manufacture in Rushden. One clicker from Cromwell Road was a man named Garley, another elderly clicker was a man called Dooley. He was very skilled at his job. There was a man called Clayton who was a sorter; he lived in one of those houses in Portland Road opposite the CWS factory. Another sorter was Charlie Hales; his son sold newspapers outside the Rose and Crown on Saturday evenings for years. As Charlie Hales passed with his arms full of work to be sorted, he would speak to Bill Clayton the other sorter. Bill would carry on sorting but would lean backwards and slightly turn his head to listen. The conversation and action were very quick and almost imperceptible. Only by following the gaze of the sorter was it possible to guess about whom they were talking about. If the conversation was long then out would come the snuffbox. I can remember all the clickers at Adams to this day, yet I only remember some of the clickers at Wilkins & Denton. I joined the Air Training Corps at Raunds and the ARP as a messenger boy when they were formed. Memories of two years at the firm are a little blurred and merge with joining up in the RAF on the Tuesday of the Bank Holiday week in 1942. Other boys in the Clicking Room were a boy called Ernie, Peter Hewit, Douglas Coe and Geoffrey Ballard. Geoffrey's grandfather had been a landlord of the Wheatsheaf Inn. Of those on the second call up one was Cyril Drage from Wollaston. Peter was killed in Bomber Command in the RAF and Cyril was killed in the Army. Another clicker became a Pilot in the RAF and he too was killed. His name I think was Parsons. He was very quiet and knowledgeable. He had relations that kept the Pub at Little Irchester. Cyril Drage was a cousin of my Mother on the Watts' side. After the Battle of Britain when the call went out for more production, they decided that we would work all day on Saturdays. This only happened for three Saturdays and they dropped the scheme. Production over the whole six days did not match production for the five and a half days. Too much leather was used which they could not supply so quickly. They employed two women in the Clicking Room to fill the labour gaps caused by the call-up. They did the bench jobs such as stamping the linings, punching caps and pricking. These were the first women that I saw or worked with in a clicking room. One said to me one day that she was going to spend a penny. I blushed because I had never heard a woman talk like that before. Later the firm opened up a Clicking Room on the top floor of a small vertical factory on the corner of Moor Road and Wentworth Road. It was my task to fetch the leather and the tickets for the orders from the clicking room in Station Road to this small factory. For this purpose a trolley was used. I would leave the leather outside the entrance in the street. The Clickers would each carry up a roll of leather as they visited the toilets for a smoke at the rear of the factory. The clickers at this little clicking room were Roly Ball (I had worked with his father at Adams' at Raunds), Edgar Lake who lived in Denmark Road and had his house damaged by bombs, Arnold, played in a Dance Band and there was Frank Eyres. Frank held an office in the British Legion. His wife very was seriously ill and later died. One day his wife had been so ill that they could not eat any dinner. Frank put head on his clicking board and cried. We all worked the rest of the afternoon in a sympathetic silence. While I worked there we all suffered with him in his troubles and final grief. Ernie Bryant came from the family that lived near Grandma Watts’ in Cromwell Road. His brother was among the missing at Dunkirk. For weeks we asked anxiously if they had received news. Then one day the great news came that Ernie's Brother was alive and a prisoner of war. I do not think that in those days we were a special generation who shared a work mate or neighbour's grief. Rather that two world wars’ tragedies brought out a community feeling of sharing grief and problems in everyone. Factory life also enabled men and women to share and talk over their personal problems outside the restrictions of married life. 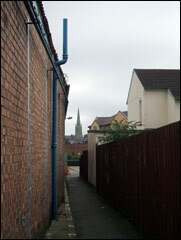 Ernie Denton lived in St Margerets Avenue. It was then that I first heard the expression "Bed and Breakfast Row". This referred to those new streets where many young married couples bought their house. This was a feature of the 1930's. Both of them then had to go out to work to pay for the house. It had been the practice of the larger Rushden factories not to employ married women. The entrance to the little factory was immediately below the top floor front windows. To go to the toilet one had to go into the street and round the back of the building. For a joke we would fill a milk bottle with water from the tank on the landing. By careful timing one could tip the water from the landing window over a person leaving the outside door below. The joke had to stop when we accidentally caught, and drenched with water, the owner of the premises who had a Bottom Stock ancillary business on the lower floors. The owner was a Deacon at the Full Gospel Chapel and he had a very limited sense of humour. It was from the windows of the top floor that we saw the flash of the German aircraft as it flew along the town and heard the roar of its engines. Looking out of the windows we witnessed the bombs exploding on Alfred Street Schools and Marlow’s factory. After seeing the bombs explode, Roland Ball from Doddington shouted out "Duck - they are bombing us" and we all dived under the benches. We all stopped work and went home. Going along Duck Street I looked up College Street and saw the side of the Alfred Street School - a heap of rubble with people climbing over to get inside. Crowds from Marlow’s factory stood in the street. Ladders were being placed against the front of the factory and men were climbing them. Two clickers had been blown onto the roof of the factory. One of those clickers killed by the bomb was Ernie Denton. Ernie was solo cornet in the Rushden Temperance Band. He was a cousin of Mum on Grandma's side. At first I went up to Grandma's for my dinners. As war progressed feeding a large family became very difficult. When rationing came it was impossible. It was at this time that Denton & Wilkins opened up a Works Canteen. This facility I used for my dinners. I think that a dinner cost nine pence. A married couple from London were the cooks. (The man and his wife later reminded me of Johnny and Fanny Craddock.) It was a novelty then to have canteen meals. We suffered many adverse comments from other workers for whom dinner was the substantial home cooked fare. I liked the meals and enjoyed being with the other workers. These came from Bozeat, Wollaston, Podington, Wymington, Irthlingborough, Higham Ferrers, Raunds, Stanwick and Finedon. The desperate days of 1940 and 1941 occupied much of the conversation. Being brought up to join in adults' conversation, and being taken to WEA classes by my Parents, I naturally joined in these discussions. Among those that I remember well are Jack Sugars from Podington. He said that his older brother shocked Podington by being the first to refuse to touch his forelock to Colonel Orlebar of Hinwick Hall. I believe that this Brother was a well-known Rushden Co-operative man. Another clicker was Jack Partridge from Bozeat  “Honest Jack” they called him. The High Street at Bozeat had several families named Partridge all said not to be related to each other. The Leather man in the Clicking Room was also a Bozeat Partridge. Wilkins & Denton’s may have taken work producing Government orders only in the past few years. This may explain why they had underpaid the Arbitration Board's Statement price for Government work. The Statement price had increased but not at the firm - they may have used an older statement. After many visits and complaints, the Trade under Arthur Allen negotiated the new price. They back dated the Statement price for only half the period in a compromise agreement. The foreman brought the back pay to the outside men who had cut the work. Jack Partridge refused to take his money. After an argument the foreman took Jack's money to the office. Mr Brown the Manager came to Jack with the money. The argument started very quietly gradually rising to a crescendo. Mr Brown was defeated. Jack refused the back pay. Mr Brown had been born, according to my Mother, at the better end of Cromwell Road. The end between Queen Street and Portland Road. As a child he always wore a velvet suit. My Mother came from the poorer middle part of that road. I had one encounter with him. I accidentally cut off the end of my little finger. When I returned to work Mr Brown brought me some papers to sign about the accident. Dad had instructed me not to sign any papers about compensation without him seeing them first. This I told Mr Brown. He was taken aback but assured me that he was doing nothing underhand and they were not about compensation. I stood next to Jack on the clicking presses and, after Mr Brown had departed, I asked Jack why had he refused the back pay when no one else had. Jack turned to me his forefinger wagging under my nose. "My boy", he said "I can look them straight in the eye if they cannot look me. I give an honest day's work and I expect an honest day’s pay". He never took the back pay. Jack was perhaps the last of the old time shoe makers - contentious, difficult and uncompromising in his beliefs. He was out of place at Rushden but he would have fitted in at Raunds. The greatest dispute in a clicking room always occurred over the pattern sizes. This was a special dispute among the press clickers. The long runs of Government work enabled a clicker to work efficiently on one size. Size eight was the base size followed by sizes seven and nine. Then sizes and tens and size eleven and five. With these sizes other work such as women's army shoes and WAAF shoes would be run in. Some clickers would collect and keep under their bench the lower size. One day only pattern sizes eleven and ten were available to Jack Partridge. Saying nothing for a week Jack only cut those sizes. The leather waste was enormous. Eventually the Foreman gave a sigh and squaring his shoulders walked over to the pressmen and demanded that all patterns be produced. He then distributed the sizes fairly again. For several days no clicker spoke to another clicker: the hand clickers kept quiet because they did the same and kept patterns under their bench. Eventually the oppressive atmosphere cleared and snuffboxes were produced and clicker was again friendly with clicker. Many decry snuff taking as a terrible and dirty habit. Perhaps it was, especially to us boys sweeping up, yet it calmed many angry scenes. Those men and their disputes may seem strange to the modern generation. In the past the factories were full of those men and women - they were all very skilled workers, who knew that they were very skilled at their job. It could be said they were arrogant with their skill. These are my Memories to add to those of my Mother. The Watts’, the Matthew's, the Sugars’ and the Partridges. Some of the characters that came to Rushden to find work, some of whom stayed to settle down. Rushden is the sum of all those characters stretching back over the generations. They all have made Rushden. This was a talk given to the Members of the Rushden History Society during a Member's Evening.